Shaving is an integral part of a man’s life. Unfortunately, for some of us it’s something we loathe rather than enjoy. And that really is a shame because with the right shaver and some basic adjustments to our routine, we can transform our shaving experience into something we actually look forward to. This is particularly important in the context of shaving daily since you’ll be doing it every single day — obviously. An electric razor has a couple of clear advantages over traditional shaving: they are very practical to use and your skin takes less of a toll compared to using a razor blade. However, shaving daily with an electric shaver poses a few specific challenges, so in this article we’ll cover just about everything, from recommended shavers to practical tips. What are some of the best electric shavers for daily use? There are a few reasons why you would want to shave daily. For example, it could be a job requirement for someone working in the military or in a very strict office environment. Or maybe shaving daily yields better results for you compared to shaving less often. Or you simply prefer the tidy, clean-shaven look. Whichever the reason, there are advantages and disadvantages. Almost all electric shavers perform better when used on short facial hair. This means that you can even use an entry-level shaver and still get very decent results. No pulling, tugging or missed hairs. If your hair grows in different directions or tends to lie flat on the skin, this is less of an issue if you shave daily. With short stubble, any potential problems are greatly reduced. Shaving takes less time and also requires less effort on your side. Usually getting all the stray hairs is time-consuming as it requires more passes. Also, the constant adjusting of stroke direction in order to always shave against the grain is another inherent issue that is almost non-existent in this case. Looking sharp and tidy. This one is pretty self-explanatory. Irritation, rashes and razor burn. Even if electric shaving is less taxing on your skin compared to using a razor blade, subjecting your skin daily to a potentially irritating factor can cause some problems. If you have very sensitive skin, your skin may need a day or two between shaving sessions to heal. It’s therefore extremely important to minimize the irritation by using a suitable shaver and proper technique. The blades and foils will wear out faster, meaning you’ll have to replace them more often. You’ll also go through a cleaning cartridge faster if your shaver comes with an automatic cleaning station. There are ways to minimize these shortcomings and we’ll get to them as well. More stuff to do daily: the actual shaving, charging, cleaning and lubricating your razor. That’s why choosing a good everyday shaver is so important. 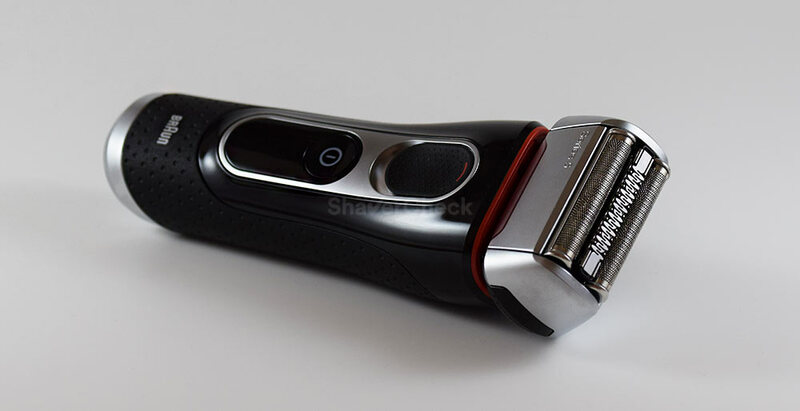 Let’s now see what to look for in a shaver suitable for everyday use. It must be very comfortable and gentle to the skin. I consider this to be by far the most important trait. The main problem with shaving daily is an increased risk of irritation and rashes, so getting a shaver that is very forgiving and comfortable is absolutely necessary. It must be easy to clean. A lot of shaving also implies a lot of cleaning. 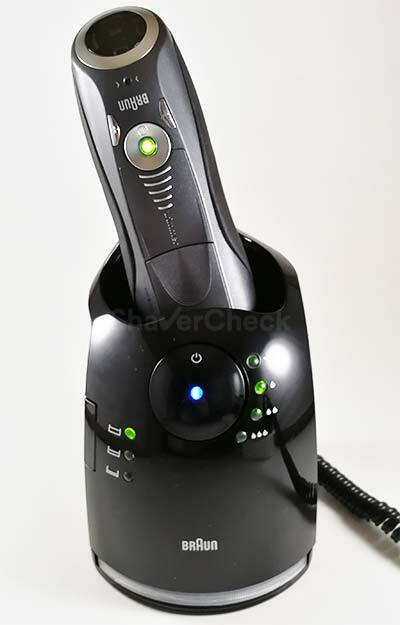 A shaver that comes with a good automatic cleaning station can also be considered. They are however more expensive to buy and you’ll have to spend some money on cleaning cartridges, but the costs are well worth it in my opinion. If your budget only allows you to get a shaver that doesn’t include a cleaning station, make sure it is easy to clean manually (more on this in the next section). While this isn’t mandatory, it would be nice to have a quick charge option. Or at least to allow you to shave with the razor plugged in. This last feature is only available with shavers suitable for dry only use. The wet/dry models can’t be used when charging as a safety precaution. A 5-minute quick charge option can be a lifesaver in those hectic mornings when you’re in a rush. It must have decent power. As I said before, pretty much all electric shavers perform better when your facial hair is short. And that will certainly be the case with everyday shaving, even if your beard grows pretty fast. This also means that you can get away with a more basic shaver and get decent results. However, I would suggest opting for one with a more powerful motor. Even if the final results probably won’t be that much different, how you actually get there will be. A powerful electric razor makes shaving faster, easier and more enjoyable. The difference will be even more significant if you have a coarse beard. Let’s now take a look at a few shavers that would make excellent choices for everyday use. This one would be my pick as it ticks all the right boxes. The Series 5 theoretically sits somewhere between Braun’s Series 3 and 7, but to be honest, it’s a whole lot more similar to the Series 7 in terms of actual performance. And that’s not a bad thing to start at all. Moreover, the Series 5 costs less than the Series 7 and the replacement shaving heads are also cheaper. To keep the price low, the Series 5 ditched the micro-pulsations technology found on the 7. Whether that makes any difference to the actual shaving performance is debatable; I would say that the differences are minor. So what makes the Series 5 a suitable option for daily use? First of all, it is very comfortable, just like the bigger brother, the Series 7. It’s also fitted with a powerful motor and comes with Braun’s excellent clean & charge station. 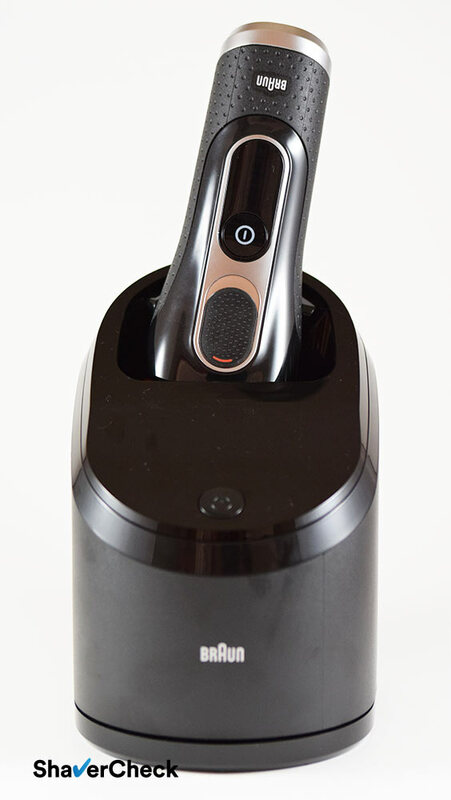 This takes care of all the cleaning hassle and you can simply toss the shaver into the station to have it perfectly clean and lubricated for your next shave. The Series 5 can handle reasonably well even longer hairs, so it’ll have no problems with a one day beard. You can find the Series 5 in several variations, suitable for wet/dry or dry only shaving and can come with or without an automatic cleaning station. And considering that Braun shavers are fiddly to clean manually, I would definitely suggest going for a Series 5 variation that includes the cleaning base, like the 5190cc or the 5090cc. The latter is only suitable for dry shaving, which means that you can also use it while charging by plugging the cord directly into the shaver. You can read more about the Series 5 5090cc in our detailed review. The Series 7 is still present in today’s roundups of the best electric shavers, despite being launched all the way back in 2010. 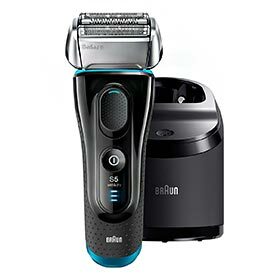 It’s a highly capable electric shaver that set new standards of performance and comfort when it was first introduced and it would make an ideal choice for daily use. While the closeness of the shave with the Series 7 is more than adequate for most men, the highlight is without a doubt the comfort during and after the shave. Shaving with the Series 7 is a real treat; the shaving head never gets warm and glides effortlessly over the skin. It doesn’t pull the hairs and it’s very forgiving. 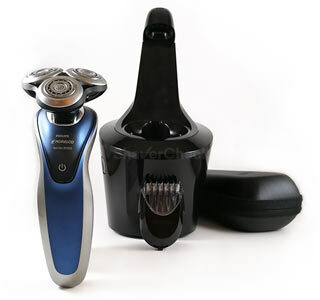 It’s also adequately powerful and will provide a fast and enjoyable shaving experience. You can get a Series 7 with or without a cleaning station. The models ending in cc (standing for Clean & Charge) like the 790cc or 7865cc include the cleaning base and are the ones to get in my opinion. They don’t cost a lot more than the solo variations and you can also use a third-party cleaning solution that works just as well as Braun’s refills, but it’s much cheaper to buy. 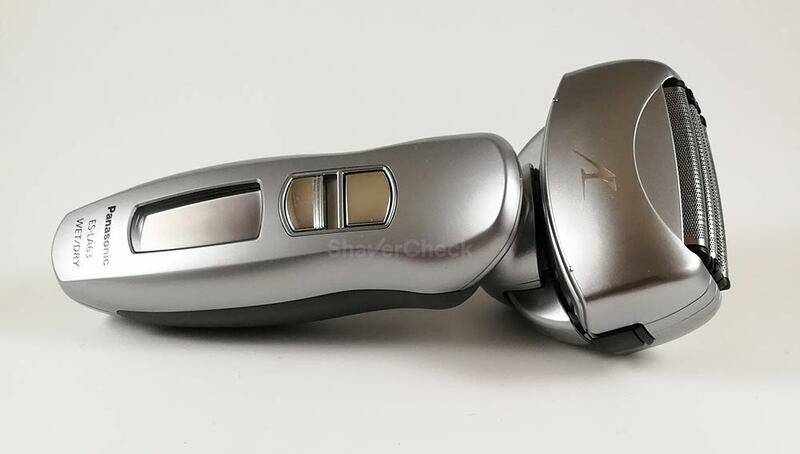 Some Series 7 models like the 7865cc can also be used with shaving cream, but since the razor is already very comfortable, most men will probably opt for a quick dry shave. Therefore, if you want to use shaving cream or gel with your electric shaver you’ll probably be better off with a Panasonic as you’ll see next. For this reason, you may want to opt for a for a dry only variation of the Series 7 like the 790cc. Another advantage is that you can shave with the razor plugged in, something that’s not possible with a wet/dry shaver. The Arc 4 line from Panasonic is probably one of the most underrated families of electric shavers you can currently buy. They are very reasonably priced and offer fantastic performance for the money, especially when it comes to sheer cutting power and closeness. The Arc 4 (regardless of the variation) would make an excellent choice as a daily shaver in several situations. If you prefer to use shaving cream/gel with your electric shaver. The Arc 4 is a whole lot easier to clean manually compared to a Braun Series 5 or 7 as the foils and blades can be taken apart. Also, if you go for a model that comes with a cleaning station like the ES-LA93-K you don’t have to clean the lather beforehand. Just toss it into the station and you’re all set. You will clean your shaver manually. Skipping the cleaning station will allow you to save some money, so if you decide to do so, manually cleaning the Arc 4 (or any other Panasonic) is very simple and fast. It literally takes less than a minute to clean it with warm tap water and a bit of liquid soap. The Arc 4 also offers a sonic cleaning mode that makes the blades oscillate very fast and dislodge any stubborn dirt. You have very coarse facial hair. 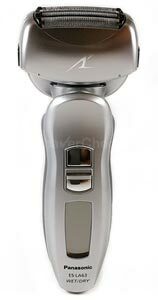 The Arc 4 shavers come with a very fast 14 000 CPM (cycles per minute) motor. This is to my knowledge the fastest motor fitted to any electric razor and even the latest Arc 5 shavers use them. The powerful motor, along with the very sharp blades will mow through the beard with ease. The Arc 4 has 4 cutting elements as opposed to 3 in the case of the Series 5/7, thus contributing to a very fast shave. You want a very close shave. The Arc 4 is slightly better than the Series 5 or 7 when it comes strictly to the closeness of the shave. You don’t have very sensitive skin. That extreme closeness also means that the Panasonic Arc 4 is not as forgiving as the Series 5 or 7. The shaving head tends to get warm, particularly the middle trimmer. I would suggest using the Arc 4 as a daily shaver if you don’t have very sensitive skin. Otherwise you may experience some irritation or razor burn. Using a quality shaving cream will definitely improve the comfort, but wet shaving also means a lengthy prep and it’s overall more time-consuming. Bottom line: if you don’t have sensitive skin and you want a very close shave, you definitely won’t be disappointed with the Arc 4, whether you use it for wet or dry shaving. If you decide to get the Arc 4 that comes with a cleaning base, the ES-LA93-K, the cleaning cartridges are also very cheap to buy and as I mentioned previously, there are no restrictions to how you use the cleaning station if you shave with cream or gel. You can read a complete and detailed analysis of the Arc 4 line here. If you are on a tight budget, the new Series 3 ProSkin from Braun can be a very good option. While they can’t compare to the Series 5 or 7 in terms of performance, the Series 3 electric shavers can still yield very decent results when used for shaving daily. The Series 3 is arguably the most comfortable entry-level electric shaver, making it an ideal choice for a daily shaver on a budget. The 3040s is a wet/dry variation of the Series 3 that doesn’t include a cleaning station and it’s usually the pick of the bunch due to its reasonable price. If you don’t have very coarse facial hair and you’re not particularly concerned with getting a very close shave, then the 3040s would be an excellent choice. Otherwise, you may want to invest more in Series 5 instead. For more details, you can read my full review of the 3040s. Panasonic also offers a budget oriented line of electric shavers, the Arc 3. It is similarly priced to the Series 3, but it is more powerful and shaves a bit closer. On the other hand, the Series 3 is more comfortable to use. You can read my detailed comparison of the two for more details. Some of the Panasonic Arc 3 models like the ES-LT41-K or the ES8103S are fitted with very powerful 13 000 CPM motors, making them noticeably faster than other Arc 3 variations. Because of this, they’re able to tackle a coarser beard and provide very good results, especially when used daily. You have probably noticed that I didn’t include any rotary shavers for daily use. That doesn’t mean you can’t successfully use one. If you prefer rotary shavers, then by all means you should be using one. Here you can find a selection of some of our recommended rotary razors. However, for most users, I think foil shavers make a better choice for everyday use. They are generally more comfortable, faster, work great on short stubble and are easier to clean thoroughly if you don’t have a cleaning station (at least in the case of Panasonic shavers). Depending on your budget, my recommendation would be the Philips Norelco 8900 available with or without a cleaning station. This is in my opinion one of the best rotary shavers you can buy without breaking the bank. 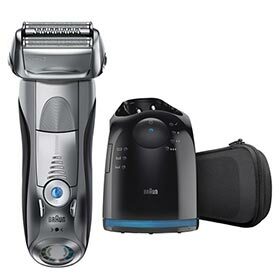 Premium shavers like 9700 only offer diminishing returns compared to the 8900. 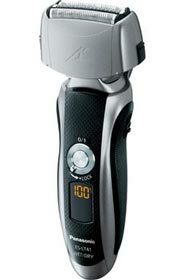 A more budget oriented rotary shaver is the Norelco 6100 that would be perfectly suitable for daily shaving. You can read my review of it here. Finding the right everyday shaver is just one side of improving your shaving experience. The other one refers to making small adjustments to your daily shaving routine and further minimize any potential problems. Don’t stress too much about getting a very close shave. Pressing too hard and doing excessive strokes every day will only cause irritation and discomfort. Close enough is good enough and even if you don’t get that perfectly smooth shave, you’ll probably be the only one to notice it. Remember that you’ll have to shave again the next day and any rashes and soreness from the previous shave will cause more problems. Aiming for moderation is probably the best approach here. Use a pre-shave lotion or gel if you shave dry. This is probably the simplest, fastest and most efficient addition to your pre-shave routine. Lotions and gels are less messy than talcum powders and they take less time to apply and to clean the mess afterward. Use the cleaning station less often. Even if you shave daily, you don’t have to use it every time. You can squeeze more cycles out of a cleaning cartridge by using the station two times a week for example. A quick manual rinse/clean during the other days will probably suffice. Also, keep in mind that Braun uses an alcohol-based cleaning solution, meaning it will evaporate pretty fast. It’s therefore a good idea to get the cartridge out of the base and put the cap back on if you won’t be using it for a few days. Here are more tips on that. Make sure the shaver is clean, charged and lubricated. If you use a cleaning station you don’t need to worry about this as the shaver will always be fully charged, lubricated and ready to be used. If your razor of choice doesn’t include one, cleaning and lubricating are vital for optimal performance, comfort and for minimizing the wear on the blades and foils. I highly recommend a spray cleaner and lubricant. Apply a soothing after-shave balm. Post-shave treatment is important, especially in the context of subjecting your face to daily shaving. Never skip this step. 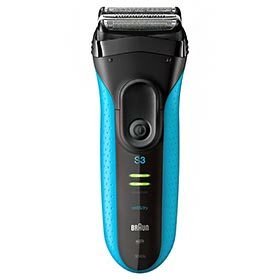 I have Braun 340s-4 wet/dry shaver, I have owned this shaver for 15 months so far and the shaving performance is just great; in the past I have had other shavers (mainly fro dry shaving) and then I had the first wet/dry foil shaver, it was Sanyo wet/dry foil shaver, pretty good but a bit noisy; then I went for some rotary shavers (Philips and Remington) but they had the tendency of irritating my skin and I decided to go for this Braun 340s-4 and it was a great choice; it shaves very close to skin, no irritation or redness and the facility of using it wet or dry gives you the versatility of shaving under the shower (wet shaving) using gel, oil or cream, or for faster and practical use doing it dry (better using pre-electric lotion for a closer and smooth shave); this is a great shaver but the downfall is that the replacement head (foil and cutter block) comes in a single unit and it can be ever more expensive than a new shaver, pity though as the shaver is great and I try my best to keep it in a good conditioning cleaning it very other day and using lubricating oil after I use under the shower so the blades keep sharp and rust free for a longer good performance ………the point will be when I have (I will have no choice) to change the cutters and foil unit…….then the shaver will be almost 2 years old then to buy the replacement unit that is around £35 pounds, it would be better to buy new shaver in my opinion …….and it is a pity as I live the saver but in this case it would be better in buying new shaver. I can definitely relate to this as I also live in Europe and the price for certain replacement heads is outrageous. In your situation it would probably make more sense to just buy a new shaver. In the USA for example the shaving cassette for the Series 3 costs around $21, which is considerably less.